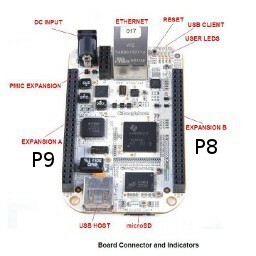 This page collects information about BeagleBoard.org's range of BeagleBone boards based on the TI Sitara AM335x, an application processor SoC containing an ARM Cortex-A8 core. The range currently consists of the original BeagleBone and the upgraded but lower cost BeagleBone Black. Most features are common to the two models. The differences between them are described in each section under a BeagleBone Black subheading. ongoing 2009: Beagle Sponsored Project Program - add a cool project and get a free BeagleBoard to realize it! The two models of BeagleBone share most features in common through employing only slightly different versions of the same TI Sitara SoC. In addition they both adhere to the same standard for expansion and interfacing through "cape" daughterboards. 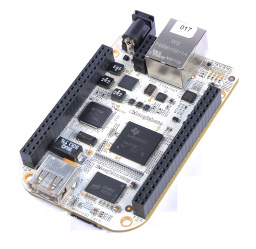 The BeagleBone is a low-cost, high-expansion board from the BeagleBoard product line. 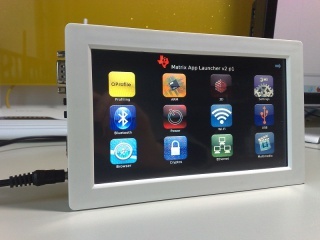 It uses the TI AM3358/9 SoC based on an ARM Cortex-A8 processor core using the ARMv7-A architecture. It is similar in purpose to earlier BeagleBoards, and can be used either standalone or as a USB or Ethernet-connected expansion for a BeagleBoard or any other system. The BeagleBone is small even by BeagleBoard standards yet still provides much of the performance and capabilities of the larger BeagleBoards. 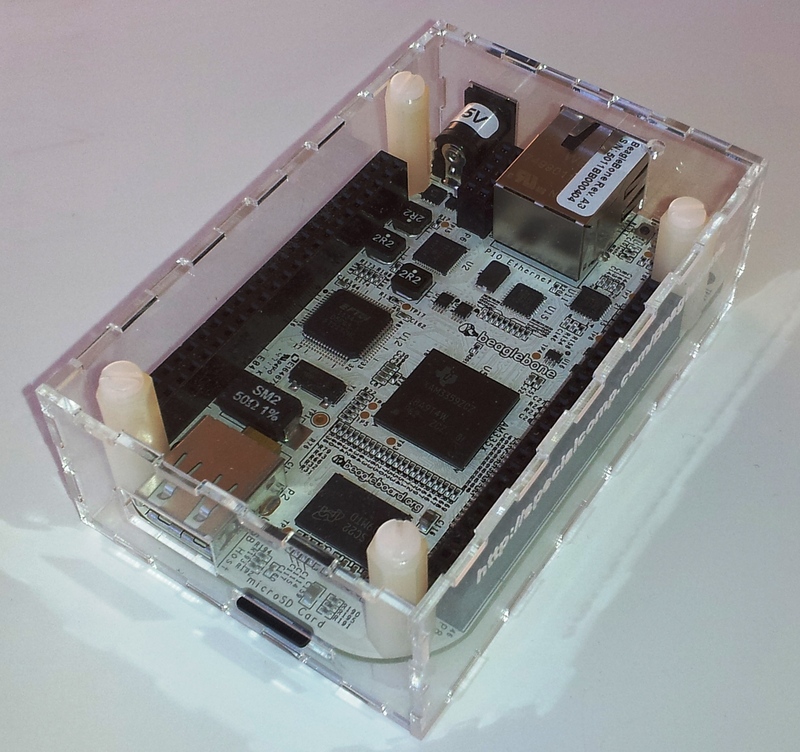 BeagleBone ships with a 4GB micro-SD card preloaded with the Angstrom ARM Linux distribution. The board uses a TI TPS65217B PMIC to generate stable supply voltages regardless of input power variation. +5V DC power can be supplied to the BeagleBone through a barrel connector or from the mini-USB, both of which are located near the large RJ45 Ethernet connector. The mini-USB type-A OTG/device client-mode socket is multi-functional. In addition to providing an alternative source of power, it gives access to an on-board front-end two-port USB client-side hub. (This is not related to the separate host-mode USB socket described later). One port of the hub goes directly to the USB0 port of the TI AM3358/9 SoC, while the other port connects to a dual-port FTDI FT2232H USB-to-serial converter to provide board-to-external-host serial communications and/or JTAG debugging. The BeagleBone's Linux serial console is available through this USB serial connection. The SoC's USB0 connection to the front-end hub works in one of two modes, and you can toggle between them at any time: it either presents the SD card as a mountable USB storage device to the host, or it provides an Ethernet-over-USB networking interface which yields a simple method of quick-start. The Ethernet-over-USB facility is additional to the BeagleBone's normal 10/100 Ethernet interface, which is directly implemented in the SoC rather than hanging off USB as in some other designs. Full IPv4 and IPv6 networking is provided by the supplied Linux system out of the box. In addition to the USB OTG Device or client-mode facilities already described, BeagleBone also provides one host-mode USB type-A socket on the other end of the board. This is driven from the USB1 connection on the AM3358/9 SoC, and provides access to USB host peripherals such as mice, keyboards, storage, and wifi or Bluetooth dongles, or a USB hub for further expansion. On 23rd April 2013, Beagleboard officially announced BeagleBone Black at a price approximately half that of the original BeagleBone. The new board's most important new features include a AM3359 SoC upgraded to 1GHz, doubling of memory to 512MB, use of faster DDR3 memory in contrast to the DDR2 of the original BeagleBone, and a new HDMI audio/visual output. (The original BeagleBone required an additional cape daughterboard for graphic output). The two boards are very similar in those features provided directly by the SoC. Despite the original BeagleBone being specified as using "AM3358/9", in practice most boards are believed to have shipped with the AM3359 generic part. BeagleBone Black has therefore upgraded only the specific device selected from the AM3359 range, and hence the differences are few. In contrast, the boards have significantly different designs but a high degree of compatibility. The BeagleBone provides two 46-pin dual-row expansion connectors "P9" and "P8" which are also known as "Expansion A" and "Expansion B", respectively. The location and pinout of these connectors is illustrated below (click tables to enlarge). All signals on expansion headers are 3.3V except where indicated otherwise. 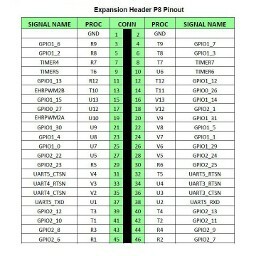 This diagram of P6 provides an UNDERSIDE PINOUT view. It is therefore laterally inverted relative to the photograph. 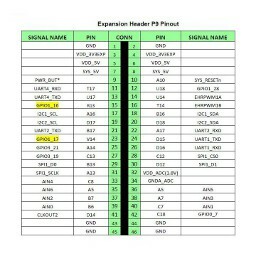 To obtain the top-side pinout that corresponds to the physical orientation shown in the photograph, swap the two rows of pins so that odd-numbered pins are on the left of even-numbered pins. USB 2.0 Powered Hub connects multiple USB devices i.e. Keyboard , Mouse ,etc to the Single USB Host Port on the BBB Device. The Advantage a Powered USB Hub provide VS USB Port is the Power draw available for device connected to the Hub. A BeagleBone Cape is an expansion board which can be plugged into the BeagleBone's two 46-pin dual-row Expansion Headers and which in turns provides similar headers onto which further capes can be stacked. Up to four capes at a time can be stacked on top of a BeagleBone. An expansion board which can be fitted only at the top of a stack of capes (usually for physical reasons) is a special case of "cape", but this usage is common for display expansion boards such as LCDs (see next section). Capes are required to provide a 32Kbyte I2C-addressed EEPROM which holds board information such as board name, serial number and revision, although this is typically omitted on simple prototyping capes. Capes are also expected to provide a 2-position DIP switch to select their address in the stack, although this too is often omitted in prototyping capes. The Capes Registry seeks to index all existing capes and cape concepts, including private projects. A registration page is available to help add capes to the list. This section lists only those capes which are available commercially or which are close to a production release, as well as open hardware designs. These USB Wifi modules have been tested and validated to work with the BeagleBone Black. Working step-by-step WiFi adapter configurations for many of these devices are available here <==. See here for how to use the I2S interface for audio. It includes a complete schematic for building a DAC. The BeagleBone Black has a built-in power management IC (PMIC) which generates and controls all of the voltage levels used by the board. The PMIC contains Li-Po / Li-Ion battery charging capability which means that it is extremely simple (and low cost) to enable portable use. There is also a built-in push-button on the BBB which can be used to soft power on/power off the board. See this link for information. The Pi Supply Switch v1.1 was originally designed for use as an automatic on off power supply switch for the Raspberry Pi which includes on, off and soft shutdown switches. The soft shutdown switch is fully programmable using software on the Pi to control the GPIO. However the Pi Supply Switch v1.1 is also compatible with BeagleBone boards (both the classic and black) as well as the OLIMEX A13-OLINUXINO single board computer. A very useful add on to help you manage power on your BeagleBone. The PowerBar is a power supply micro cape for the BeagleBone Black and White. It sports a buck/boost regulator designed to provide 5V power from almost any battery source (3VDC to 14VDC). Project files are available to build your own or you can purchase one from AndiceLabs. The PowerCape uses the same regulator as the PowerBar but adds a LiPo charging circuit and AVR power supervisor in a full cape format. It can power the BeagleBone from a DC source, a LiPo battery, or a combination of both allowing for use cases such as an integrated UPS, solar-powered node, car computer, etc. Applications can monitor battery voltage and current via an INA219 on the battery input and can schedule BeagleBone power-up conditions and/or timeout via the AVR. LCD displays for the BeagleBone are typically implemented as capes which plug in as the top board in a stack of capes, for reasons of visibility. Such displays are often larger than the BeagleBone itself, so the normal physical relationship in which a daughterboard is smaller than its host board is inverted. In this arrangement it is the expansion board that provides the physical support for the BeagleBone. 3.5" TFT LCD screen, resolution 320x240, 4-wire resistive touchscreen, seven buttons at finger-friendly positions. 4" TFT LCD screen, resolution 480x272, 4-wire resistive touchscreen, seven buttons at finger-friendly positions. 7" TFT LCD screen, resolution 800x480, 4-wire resistive touchscreen, rear mount for BeagleBone and capes. A very low cost LCD implementation for the BeagleBone Black using the PRU-ICSS is here. It requires a graphics library to be written; currently it just displays a couple of lines on the screen. 7" LCD screen, resolution 1024*600, 5 point Capacitive touchscreen, 5 user keys, audio in/out, RS232/485/CAN, 3 axis accelerometer. Available at Logic Supply US and Logic Supply EU. 4.3" TFT LCD screen, resolution 480x272, available in non-touch and 4-wire resistive touchscreen versions, with seven buttons. 7.0" TFT LCD screen, resolution 800x480, 4-wire resistive touchscreen, with seven buttons and rear mount for an additional cape. A compact color OLED graphic display (source code and schematic) are available here. It includes a simple library for text and some primitives. Hammond Manufacturing has cases for the BeagleBone Black and White available from distributors such as Mouser and DigiKey. 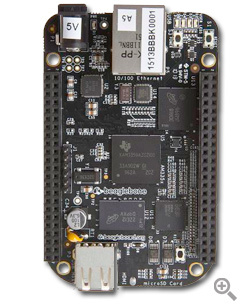 BeagleBone's default operating system is Angstrom, which ships with the board. You can find more information in BeagleBone Operating Systems section. For the BeagleBone Black, see its official documentation. Instead of officially supported Debian images, you can also use stock Debian from an external HD. Software development on the BeagleBone is normally no different to any other Linux platform, and typically varies with language and with the IDE used, if any. This section deals only with development issues that are specific to BeagleBone, or mostly so. When developing c/c++ on a linux desktop, a toolchain is available for cross-compiling the code for arm. However no such toolchain is readily available for windows. Netbeans can be used to write the code on your desktop, save it in a location accessible to the beagle, and then automatically compile it on the beagle itself using ssh and the built in compiler on the beaglebone's OS. Netbeans can also use GDB for remote debugging over ssh. BlackLib library is written for controlling Beaglebone Black's feature with C++. It is created for reading analog input, generating pwm signal, using gpio pins, and communicating with other devices over uart, spi and i2c. In addition to them, it includes debugging feature. So you can check errors after call any function in the library. It also takes parallel programming, mutex usability, realization of directory operation and realization of time operation ability with the last update(BlackLiv v3.0). The modern BeagleBone kernels are Maintained by Koen Kooi and are available on the 3.8 branch at https://github.com/beagleboard/kernel/tree/3.8 . This repo contains a set of patches and a script which downloads a mainline kernel and then patches it appropriately. Exact steps for building it are in the README. echo -<slotnum> > $SLOTS to uninstall, but read through the web page and comments section first to see what $SLOT is set to). For BeagleBoard frequently asked questions (FAQ) see community FAQ and "official" BeagleBoard.org FAQ. BeagleFu -- BeagleBone/Board Community, News and Projects. Beaglebone and the 3.8 Kernel Details about the 3.8 Kernel, its use of DT and the capemanager. SolidWorks 3D model of the BeagleBone Black on GitHub, includes 3D PDF. Notes and how-to guides on using the BeagleBone Black as a web-server on GitHub.